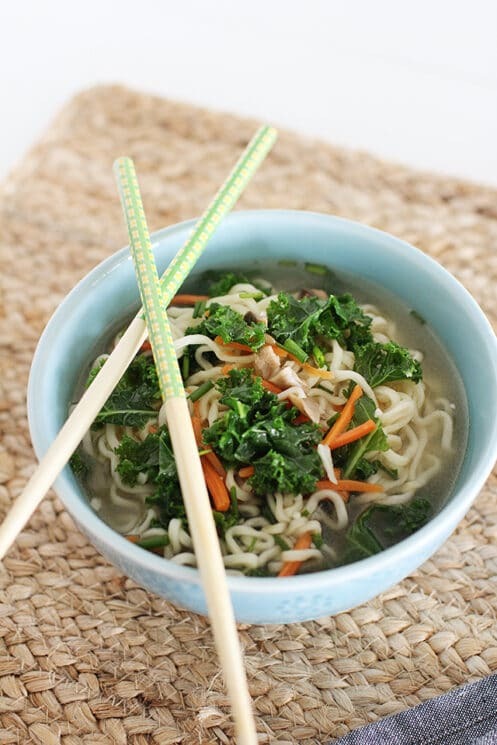 Revamp processed Top Ramen to taste fresher than ever with a gingery broth and loads of fresh mushrooms, carrots, and greens. Make it in minutes in a single pot! Top Ramen, famous in dorm rooms everywhere, does have a certain appeal. 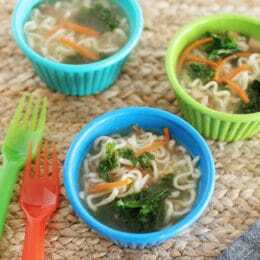 With its bold punch of flavor, chewy noodles, and soothing, sippable broth, it might tempt you–and especially your kids–on a cold or hectic day. Now imagine all the goodness you can add to this meal by re-creating it in your own kitchen! Read on to see why this is the best idea ever, and learn some tips and tricks for how to do it. Why Make Homemade Top Ramen? 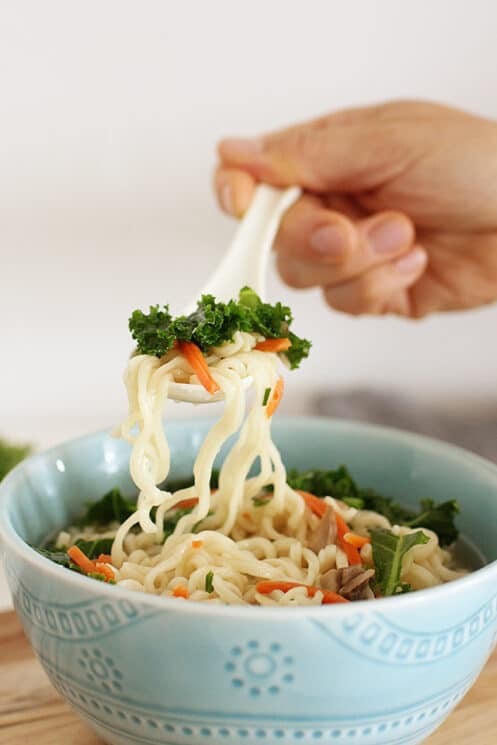 When you prepare this Top Ramen recipe at home, you make a few major upgrades to these famous (or infamous) slurpable noodles. First, you’re using fresh vegetables like kale, carrots, and mushrooms, which automatically adds vitamins, minerals, and fiber to your meal. Second, making Top Ramen at home drastically reduces the amount of sodium you and your kids are eating in a single meal. 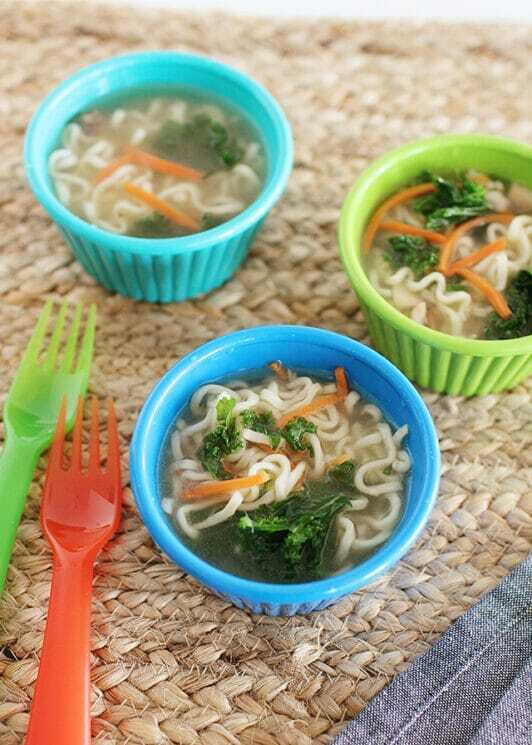 Instant ramen contains more than 1,800 mg of sodium in just one packet… that’s more than 3/4 of your kids’ recommended daily sodium intake! 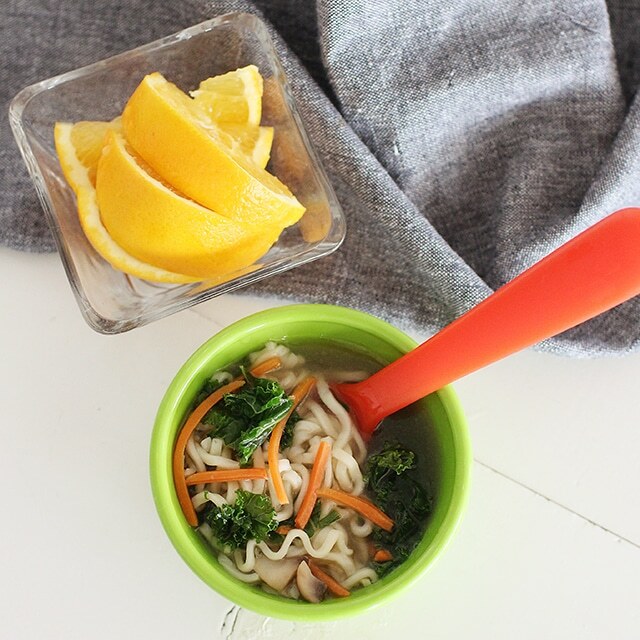 This homemade version contains around 20 mg of sodium per cup of broth in your bowl. 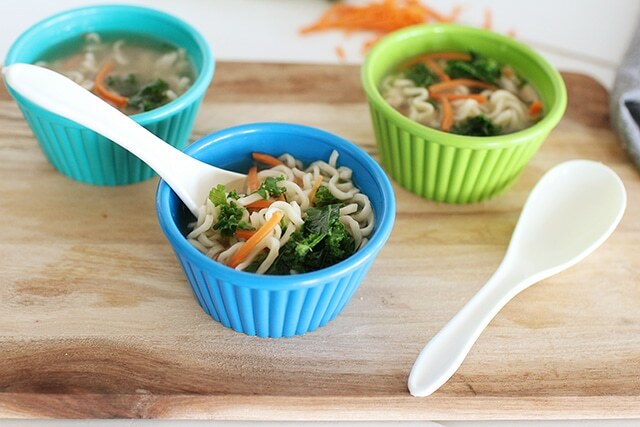 Finally, making these delicious gingery noodles from scratch turns a single-packet processed food item into a family meal that you and your kids can share. Sure, it’s a little extra effort. But it’s so worth it! This recipe uses the noodles, and just the noodles, from two packages of instant ramen. You know the little square packets of seasonings that come inside the package (aka the salt bombs?) You can go ahead and drop those right into the garbage. Go ahead. You won’t miss ’em. 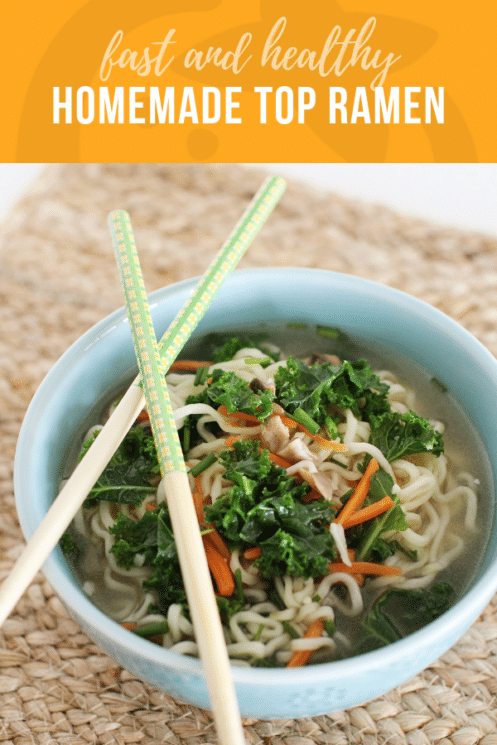 If you’re not into the idea of using the instant ramen noodles at all, or if you’re looking for a whole grain substitution, feel free to use brown rice vermicelli in this recipe. The final product will have a bit of a different texture and shape, but the flavor profile and cooking instructions are the same. This is a great recipe to prep ahead for: if you can grab ten minutes to chop your veggies and store them in a jar, you’ll be primed to throw this meal together so fast, and without having to haul out the cutting boards in your (undoubtedly pristine ;) kitchen. Try it with pieces of leftover chicken, pork, or shrimp for a little extra protein and flavor. Try more super soups like Immune Boosting Chicken Wild Rice Soup, and Hidden Veggie Mac and Cheese Soup. Heat sesame oil in a large wok over medium heat. Mince garlic and grate fresh ginger. Add to hot oil. Stir fry for 1-2 minutes, stirring continually. Carefully add broth and water. Bring to a boil, reduce heat and simmer. Slice mushrooms (or dice if it is preferred) and simmer for 10 minutes allowing to soften. Add noodles (do not use flavor packets) and cook until softened; 5-6 minutes. Add chopped chives and remove from heat. Chop kale and grate carrots. Add to noodles, cover and let rest for 3-4 minutes, until kale softens. Serve warm. Top Ramen noodles are categorized as a processed food. The noodles themselves are under scrutiny for causing metabolic syndrome. Unless the foods are whole foods, organic, non-gmo, etc, I wouldn’t call it “super healthy”.